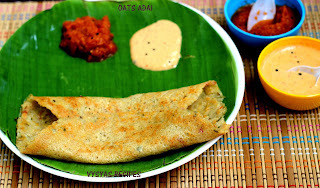 Oats Adai dosa is made with oats and lentils which gives nutritious to our body.Health benefits of Oats comprises of one of the best sources of Inositol, which is very important for maintaining blood cholesterol level.high fiber content present in oats, they are said to be helpful in preventing bowel cancer. you eat regularly, the rise in blood sugar level gets spread over a longer period of time. This helps prevent many of the complications associated with diabetes.Oats contain phytochemicals (plant chemicals), which are believed to protect the body from chronic diseases, such as cancer.lentils are rich in protien. 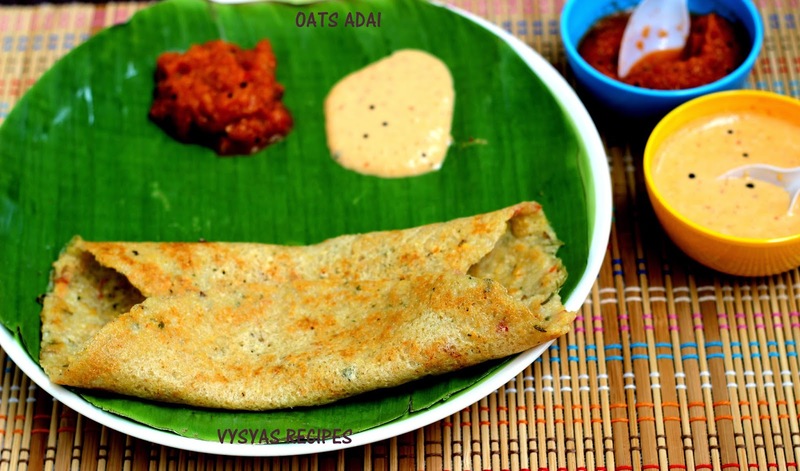 Proteins are vital for muscle building and the overall development of the body.Now we prepare fiber and protein rich adai. Raw rice - 1/2 cup. 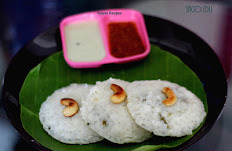 Idli rice - 1/2 cup. chana dal - 1/4 cup. 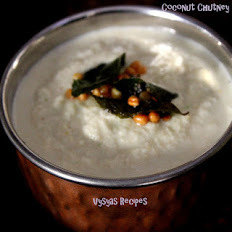 urad dal - 1/4 cup. Moong dal - 1/4 cup. Toor dal - 1/4 cup. cumin seeds - 1/2 tsp. pepper corns - 1/2 tsp. fennel seeds - 1/2 tsp. Soak the Raw Rice & Idli rice for 4 hrs. (just add oats as such, wash and add dals to grind ). 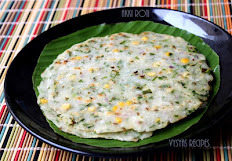 Grind everything given under ingredients column with needed salt and water into a coarse batter.consistency is normal adai consistency. 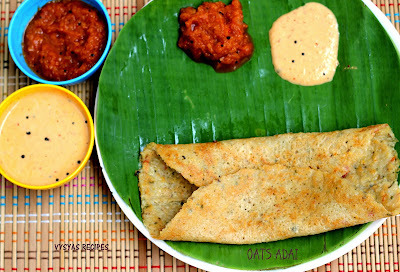 Heat the tawa/griddle, take a ladle full of batter and spread the batter, as we make normal adai.Drizzle some oil over it.when one side is cooked flip the adai, remove it from tawa when both sides are cooked. 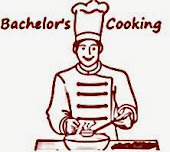 It is not necessary to soak oats or dals,just wash the dals and add as such, with oats and other items. Adai gives good taste, if you add dals as such rather than soaking. 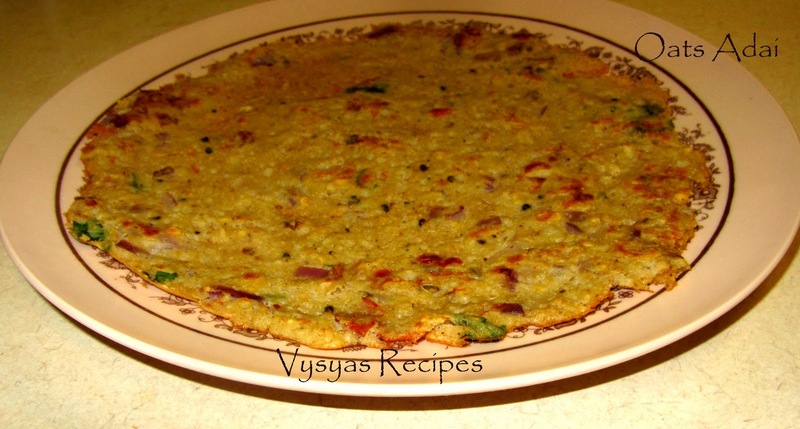 you can add chopped onions, and cilantro to the batter, or you can sprinkle chopped onions on top of adai. 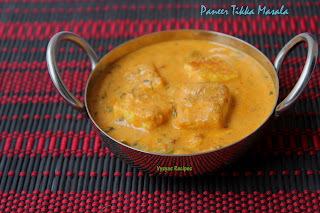 I tried this yesterday and I must say its the easiest and tasty recipe too! It didn't require soaking at all is a grand advantage! Thanks for the time saving recipe!